Those of us who struggle with our weight love something sweet at least once in a while. Sugar tastes great and works well in baking, but at 16 calories per teaspoon, most of us must conserve. The substitutes don’t quite taste right and the whole synthetic concept can be a turnoff. 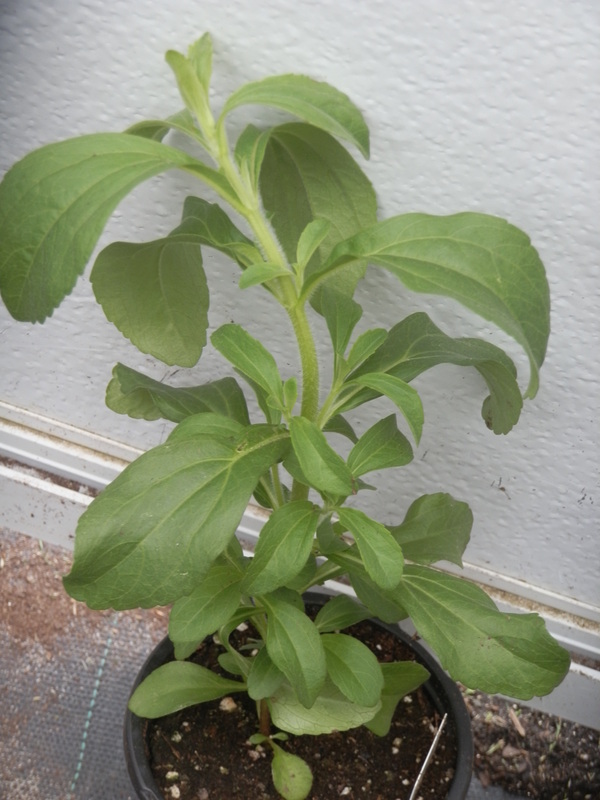 Enter stevia (Stevia rebaudiana). It is a member of the aster family and its dry leaves are 30 to 40 times sweeter than sugar. Leaf extracts can be 300 times sweeter. Stevia is safe and commercial products are in most grocery stores, but the best part is it’s easy to grow. Stevia can attain heights over three feet but it is easily maintained much shorter. Regular pruning keeps it branched and compact. Plants grow best in well-drained soil and warm conditions. While they are heat lovers, maximum leaf sweetness occurs when temperatures begin to dip in the fall. Stevia tolerates some shade but thrives in full sun. Leaves emerge from hairy stems in groups of two. The toothed edged foliage reminds many of mint plants but stems are not square. Clusters of small white flowers will appear during the season, but it pays to keep them from developing. Plants lose vigor once flowers mature and produce seed. Keep pinching them back regularly to produce healthy foliage throughout the growing season. Stevia is a tender perennial that is marginally hardy here with some protection. However, it makes an attractive houseplant in a south facing window. 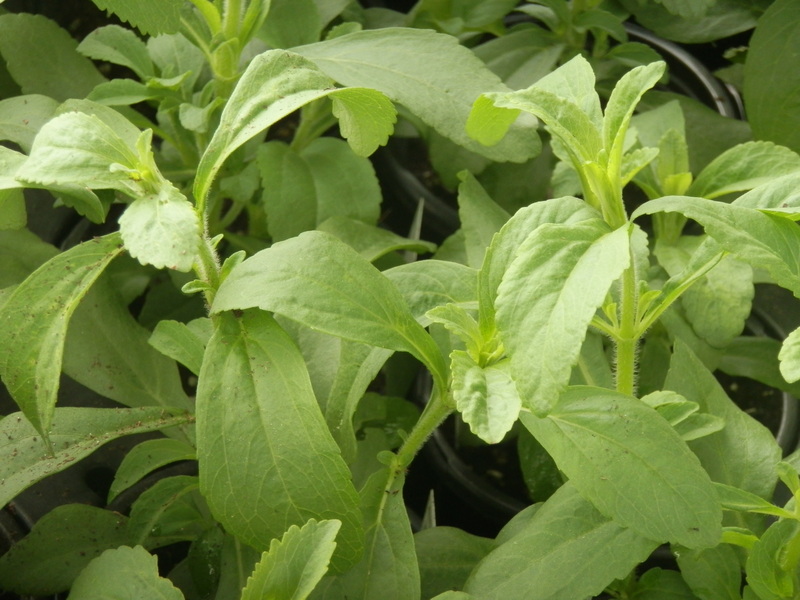 Stevia can be propagated from stem cuttings or from seed. Plants should not be set outdoors until frost danger has passed and soils have warmed well above 50 degrees. Patience pays off. Stevia leaves can be used fresh or dried. They are delightful fresh for sweetening drinks. They’re great when steeped with tea. Chopping and garnishing fresh leaves on fruit salads adds additional sweetness. Fresh leaves are less sweet than dried ones. However, gram for gram they are still much sweeter than sugar. Stevia leaves are easy to dry. Bundle fresh stems and hang them upside down in a warm dry location until leaves are crispy. Strip the leaves and crush them into a fine powder. A coffee grinder or other mechanical food processor works great. Generally speaking finely ground preparations are more efficient. Stevia use has been linked to lower blood glucose levels and some research has indicated it may be better for dieters than other low calorie sweeteners too. Many consider stevia healthy simply because it is natural. Poison hemlock, jimsonweed and Amanita mushrooms are also natural, so I wouldn’t endorse anything if natural was its only attribute. Stevia has been used as a sweetener throughout much of the world for centuries, but it’s relatively new to this country. The FDA regards stevia as safe. However, nausea, bloating, dizziness, muscle pain and numbness have been reported by people after ingesting it. I have experienced no ill effects from fresh, dried or processed stevia and will continue to buy it as well as grow it myself. This entry was posted in foraging and tagged aster family, cuttings, leaf extracts, lower blood glucose levels, seed, stevia, sugar substitute, sweetener, sweeter than sugar, tender perennial. Bookmark the permalink.